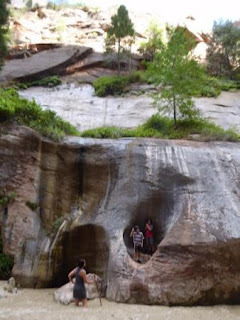 The drive from the Grand Canyon to Zion was less than 3 hours and we only had the following day to see the area, so we picked The Narrows hike which is considered one of the premier hikes on the Colorado Plateau. The shuttles to the trailhead were overflowing and the number of people of all ages was astounding. They recommended walking sticks which we rented and I can’t imagine attempting it without one, but people did—both young and old! 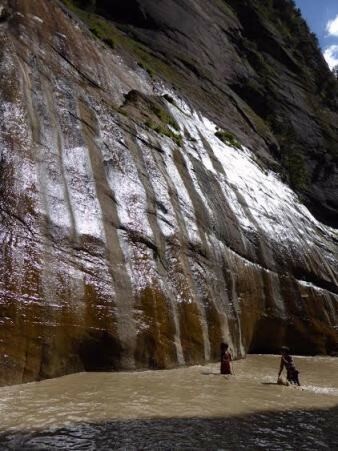 It had rained the night before so the typically clear rushing water was instead murky and brown like chocolate milk. This just made it more of an adventure because you couldn’t see the rocks under the water. The hike is slow going, and we only made the first part of the hike but it still took about 2 hours. The following day, we were on our way to Mesa Verde when our RV started having acceleration problems. Yes, yet again, we had to change our plans. Rather than making it to Mesa Verde, we literally spent the night in the desert on an Indian Reservation on Highway 160 between Red Mesa and Teec Nos Pos, AZ. on Indian Route 5043. At this point, the boys (and all of us) were great about rolling with the changes. Most of the local folks didn’t bat an eyelash at our hard-to-miss presence, but one friendly gentleman stopped to chat. He told us that “his people” would not bother us nor be bothered by our presence. It was an interesting experience that we’ll always remember and ended with a beautiful sunset as the air cooled down. The tow truck picked us up at 5:30am and actually kept us in the RV during the hour long tow! 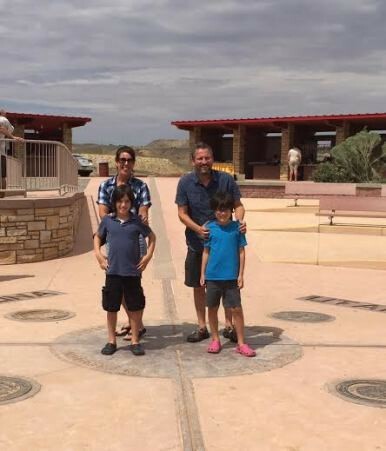 Once we got to Cortez, CO we were told by the service station that they couldn’t handle an RV so we had to find another place (yes, we told them we had a 24ft RV before we had it towed there). Thankfully, we did find another place and rather than another tow, we took our chances and drove 1.7 slow miles to the next place where she was eventually repaired. Again, another rental car and motel were required. We stayed at The Retro Inn which was not bad (they had a great breakfast and even shipped my glasses to me after I left them behind). 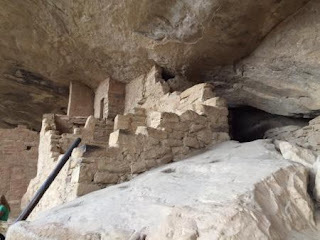 While in Cortez we were able to stick with our plan to visit Mesa Verde where we did the amazing Balcony House Tour. 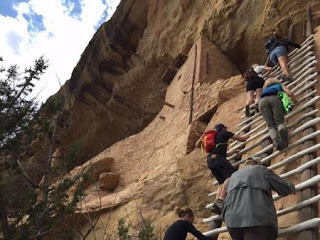 The tour is known as the “adventurous cliff dwelling tour” and is a one hour ranger-lead tour that involves climbing a 32 foot ladder, crawling through at 12 foot long tunnel that is only 18 inches wide, and climbing up a 60 foot open rock face with two 10 foot ladders in order to exit the site! Yes, it was adventurous and very unique. Verde, we took the opportunity to drive there while staying in Cortez. It was obviously super touristy—surrounded by booths selling trinkets and jewelry, but it still makes for a fun picture and a great memory! Unfortunately, the fuel pump problem kept us in Cortez for a couple extra days and prevented us from our next stop at Dead Horse Point State Park where we planned to visit the Moab area and do a bike ride. We just had to let that go and went on a day early to Rocky Mountain National Park—our last national park stop of the journey! After a beautiful, but long and treacherous drive all the way through the park to our campsite at Glacier Basic Campground, we settled in for dinner and a campfire. 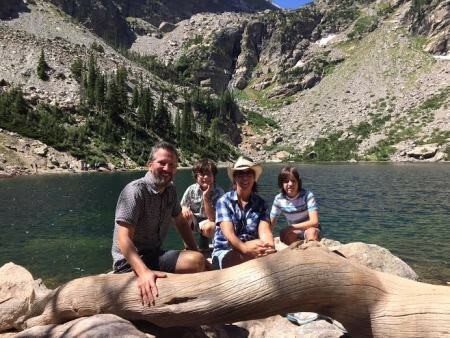 The next day, we had planned a hike, but after taking the shuttle to the trailhead, my son and I both felt ill and after trying to start the hike, thought it would be best to skip it and take the day to adjust to the altitude. So we had a quiet day at the campground and tried a new hike the following day. Success! We enjoyed a hike to Emerald Lake and on the way passed Nymph Lake and Dream Lake. It was chilly when we got to Emerald Lake but the return trip was quick as more of it was downhill. On the way home from Colorado, we had the opportunity to spend a bit of time with cousins in Lawrence, KS. We all had a great time and when we left, we planned to head to Dubuque, IA for one last night of camping when, you guessed it; change of plans. The fuel pump was acting up (or something seemingly related) so we decided to scratch that plan and make a B-line for HOME! We were determined to get home and made it despite horrible weather that followed us most of the way. We all felt strange walking into the house after so long. It was immaculate (the renters had left it as I had for them) and quiet (Charlie the Beagle was still on the farm). The kids were super excited to be home and had huge smiles the entire night as they walked around in awe of each room in the house. Oh, and guess what the final surprise was? The next morning we were unable to unlock Loretta! The lock was broken and we now have to get in and out with a ladder through the emergency exit window. Sheesh! We still love her (our RV) and had a great time, but boy, I tell you…to do it again, I think I’d find new wheels! FLG Note: This wraps up Mary's Campfire Stories blog series. 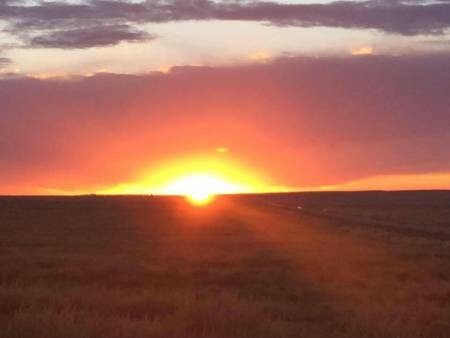 If you'd like to follow her blog for any more updates on Loretta, you can find her here. We hope you enjoyed her storytelling adventure as much as we did!